Ride the waves in style with custom boat graphics and lettering from the pros. Graphic designs for boats, yachts, speed watercraft — even jetskis — turn the water into your template. For commercial fleets, custom boat lettering yields creative marketing and branding impact for your enterprise. For personal watercraft (PWC), boat graphics bring new life to beloved vessels, lending both a cosmetic and craftsperson’s touch. SpeedPro is the nation’s top printer of large-format graphics. We’re on 3M’s certified vendor list for vehicle and boat wrap vinyl, meaning our network of studios houses the best materials for the best custom print jobs — exactly what’s required for standout watercraft. What Is Custom Boat Lettering? Boat lettering is custom-designed graphics placed on some of watercraft’s body. They are usually fabricated from a durable base vinyl and water-resistant, fade-resistant inks. Top-quality, professionally printed graphics are long-lasting across many water applications — without worrying about sun, spray, seam tears or general wear. Boat lettering is highly tailored. You can choose the size, scale, colors, laminate, detailing and overall design of your custom boat graphics. We provide the printers and materials needed to get these unique wraps off the page and on the water, plus a dedicated account coordinator to ensure end-to-end order satisfaction. Some SpeedPro studios may have in-house graphic designers to create boat lettering for you. Hull: Full wraps span the entirety of a boat’s body. That means stem-to-stern coverage featuring patterns, logos, vessel names, corporate branding, slogans and more. A full-wrapped hull provides the largest canvas for your boat graphics. Port and Starboard: Your vision may constitute side-specific detailing, in which case a partial wrap is ideal. Partial boat wraps and graphics cover only a vessel’s sides, whether the right (starboard), left (port) or both. Bow: Boat fronts remain one of the most popular locations to place lettering and graphics. Their forward-facing designation means others will easily notice images and logos while on the water. Stern: The rear of the boat is a great place for boat decals or individual images placed in lone “spot” locations. Like bow graphics, they add statement embellishments to make your vessel distinct and dynamic. Professional or service watercraft need visuals that distinguish and delight. Graphics and lettering deliver that — and more. Branding is the act of separating yourself from competitors. It involves many marketing, PR and advertising avenues curated together to build an impression. Those impressions become what people associate with your business or organization — visuals, slogans, color schemes and even emotions. Commercial water vehicles are an extension of your branding. Boat hulls provide blank templates to place your company name and logo onto. You can layer vivid colors, bright backdrops and bold or patterned detailing to customize your boat graphics further, ensuring it helps develop your brand. Graphic designs for boats can trigger a tidal wave of attention. Adorned with eye-catching, strategically designed and placed graphics, boats that stand out serve a few essential purposes. The average person’s attention span is less than eight seconds. Attention is a scarce resource. Any tactic that cuts through the noise to captivate and connect makes serious branding impact. Consumers are exposed to nearly 10,000 brand messages a day. This includes commercials, packaging, logos, billboards, digital and print advertisements, endorsements, social media, email marketing, displays, signage, slogans, flyers, tags, text campaigns, and much, much more. In other words, consumers are saturated. Branding impact triggers leads. Leads are potential customers. Your lead base is essential to gaining more extensive influence and recognition in your industry — as well as growing your customer base. A lead funnel that includes boat advertising complements lead generation in target markets in an exciting and impactful way. For personal watercraft, putting your stamp on your boat or jet ski is just as essential. It’s your boat, after all. Make it a reflection of your tastes and personality. Plus, graphic installations can extend a boat’s lifetime. Boat lettering substrates and laminates create a shield, protecting the boat’s body from wear, tear, fading and damage. Boat lettering offers a cost-effective way to revitalize the appearance of boats, yachts, jet skis, speedboats and more. Between preparation, fiberglass, gel coat, paint and varnish work, refinishing a boat’s surface the traditional way costs $150 to $250 per square foot. Plus, those changes will be permanent. Custom boat lettering is cost-effective and flexible. Graphics can be easily swapped out within their warranty without damaging your watercraft’s face or structure. If company information or logos change, you don’t have to worry about expensive or cumbersome branding overhaul. In short, custom boat lettering means just that — custom, through-and-through — easily redesignable and reconfigurable with the right large-format printing partner. The United States Coast Guard requires commercial and recreational vehicles to display their watercraft’s registered names and hailing port somewhere on their hull. Vessel compliance also includes displaying boat registration numbers and validation stickers. These displays must be clear and legible, with some boats even qualifying for letter and number sizing requirements. Watercraft graphics can incorporate, not impede, these regulations. Custom boat lettering is a creative and impactful way to maintain compliance without sacrificing boat aesthetics. For commercial watercraft, in particular, the appearance of your boat’s hull signals to passengers your level of professionality and authority. Don’t leave that impression to chance. What’s more, service watercraft such as police boats or municipal tugboats may have additional display requirements. Boat graphics are an ideal way to designate these industry-specific, compliant vessels. Your boat is an extension of you. Like painting your house or getting a new haircut, custom boat lettering conveys style and personality in seconds. With the flexibility and wide range of custom graphics, boat owners are liberated in their vessels’ visual presentation yet can change or update it when they please, as they please. After all, the reasons for acquiring a boat or a water vehicle are entirely your own. Nostalgic or adventurous, a goal worked toward over the years or a treasured piece of family inheritance, custom boat lettering and graphics honor that story, making your boat something to be proud cleaning. You’ll have a number of graphic design choices and elements at your disposal with SpeedPro’s custom boat lettering services. Substrate vinyl: Boat lettering and graphics come printed on a durable and water-resistant vinyl base. Most boat graphics orders are made from cast vinyl, a material that begins as a liquid and is poured into cast molds, then left to solidify before being fed through the printer. SpeedPro uses 3M cast vinyl, the leading manufacturer of this substrate and the most common choice for vehicle and boat wraps. UV-resistant, water-resistant inks: Custom boat orders are printed using UV-resistant and water-resistant inks. This gives lettering and images a long-lasting, durable life protected from the elements. What’s more, SpeedPro’s UV-ink system is environmentally friendly. This ink’s formula contains no solvents, and the ink is “cured” under direct UV lighting strips positioned during live printing. The contact with UV light transforms the ink into a thin yet strong film that adheres to the vinyl substrate. It’s the ideal ink type for outdoor graphics applications like boat lettering. Adhesive-backed graphics: Strong adhesion is paramount for boat lettering graphics. Given the frequency of exposure to the elements, adhesive backings must come formulated for airtight binding and endurance. SpeedPro offers a range of semi-permanent and permanent adhesion backings for its boat graphics. Full Wrap: A full boat wrap means stem-to-stern coverage. Designs account for the hull majority, including all port and starboard dimensions plus stern and bow graphics. 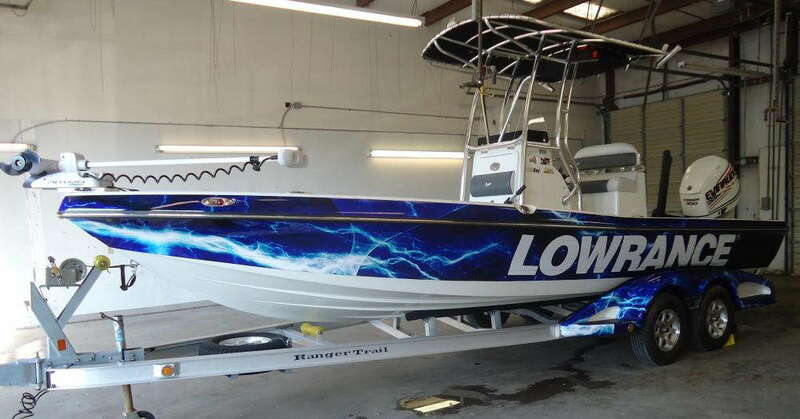 SpeedPro can do boat wraps that contain even smaller custom pieces to complement a full wrap as well, including graphics for the gunwale and similar boat edges. Partial Wrap: Partial boat wraps cover a vessel’s sides. This means graphics and lettering for a boat’s port or starboard sides. While partial wraps only cover these two areas, that coverage is extensive and can include many tailored, eye-grabbing details. Spot Wraps: Spot wraps are custom, water-resistant decals fabricated for boating environments. They are the smallest and most flexibly positioned graphics option, placed and attached to a specific spot. Spot wraps are ideal for displaying a boat’s name, a company’s name or printed logos. Depending on the functions of your vessel as well as your final vision, one wrap type or vinyl substrate may be preferable to another. Your local SpeedPro studio’s consultants can work with you to align the best substrate, inks and coverage amount to your needs. Installing boat lettering takes a few intuitive steps to ensure a boat gets properly prepped for adhesion success well before any vinyl gets placed. Boat wrapping is more intricate than its cousin, vehicle wrapping, where printers and installation crews can use make-and-model-specific templates to get the dimensions right. Since sizes, angles and dimensions on watercraft don’t always carry the same make or model templates, you’ll need to pass along accurate measurement specs to your print studio during early design consultations. Some wrapping studios may be able to assist you in conducting precise boat measurements. You can also consult area shipwrights or similar specialized labor to come on-site and measure for you. Boat hardware impedes the application of cast vinyl. Substrates need a smooth, even surface to bind correctly with their base, preventing air bubbles from forming and to seal off moisture seepage. Both of these can lead to “edge lifting,” where the graphics begin to peel around application edges due to improper water and air exposure. Remove handles and hooks, especially for tug and service boats where stern i-hooks are common. Remove rub rails for extra caution. Rub rails and similar factory silicone pieces can prevent comprehensive, tight vinyl suction around a boat’s perimeter. It is safer to remove then re-install rub rails after placing vinyl beneath them. Surface preparation is paramount for a long-lasting, durable and dependable boat graphics. Remove old vinyl or decals. Use biodegradable vinyl softener or similar adhesive removers. New vinyl cannot bind correctly against old vinyl and will need a clean, workable base surface. Wash the entire boat. Use liquid soap and a microfiber towel to wash and dry the boat’s hull. Abrasive cleaners or detergents are not recommended. Consider cleaning the entirety of your watercraft even if you’re only installing a partial wrap or spot decals. Wipe it down with alcohol. Alcohol removes any residual grime as well as acts as a final smoothing agent before application. Here are a few final tips so you can install your graphics with ease. Prep your boat during ideal conditions. Shaded or even indoor worksites are preferred. Temperatures should be at or above 70 degrees during installation to assist with proper adhesion and drying. Use mild heat on challenging application areas. Apply a hair dryer, heat lamp or heat gun on parts of the vinyl substrate that need to stretch over boat curves and angles. Heat will loosen the vinyl just enough to make application easier without overstretching or melting it. Consult the experts. Many SpeedPro studios offer boat lettering installation as part of their services. 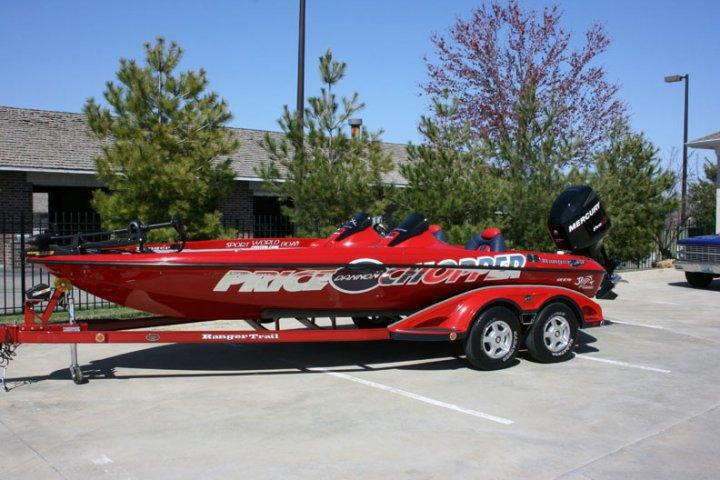 This begins with accurate spec measurements and concludes with installation day, where SpeedPro boat wrap specialists can clean and prep your watercraft, remove old graphics and install the new ones with specialty tools. There’s nothing ordinary about the rush of wind and the spray of water as your boat cruises across the waves. Why settle for something that looks ordinary, then? 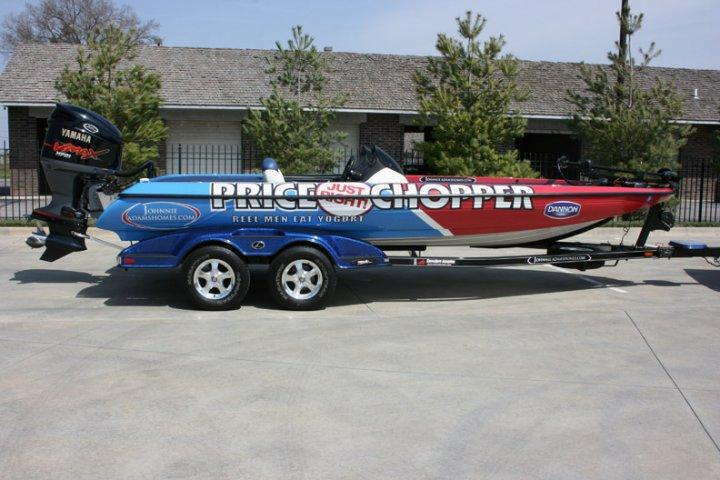 SpeedPro has worked with dozens of clients on elevating the impact of their watercraft through custom graphics and images. We’re ready to do the same for you. Find your local studio to request a quote or get started on a boat lettering and graphics consultation today.